2012 – It’s getting lonelier at the China’s Daily Deals Top. 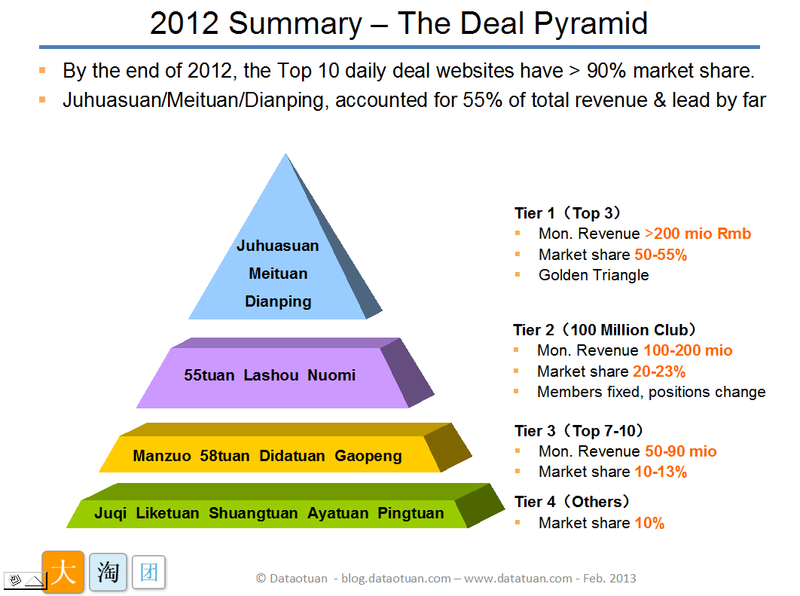 There are 3 leaders, Juhuasuan, Meituan and Dianping, making up tier 1. To be a member of the Tier 1 club monthly revenue has to be over 2 billion Renminbi. Based on Dataotuan’s data, the top 3 accounted for 55% of the total revenue. If the other 7 of the Top 10 websites are included more than 90% of the market is already taken, leaving less than 10% for all the other players. The daily deal websites, similar to last year, were launching the most deals in East China, far more than in any other region. Southwest and especially Northwest China were trailing far behind. This may change in the coming years as there seems to be developing more interest in tier 3/4 cities. The mobile Internet (especially smart phones) and ways to pay by mobile will help here.